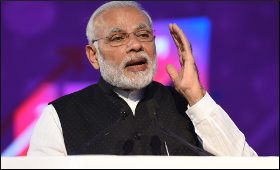 Making a veiled attack on the Congress and other parties accusing them of stalling the triple talaq bill, Prime Minister Narendra Modi on Saturday said that his government dared to take decisions that others were afraid of taking. "Three days ago, the Centre took a decision that was needed since decades. When the intentions are clear, then one needs to take decisions that no other can dare to take. One of these decisions was on triple talaq. "When our government made the decision on triple talaq, there was an effort to stall it in the Rajya Sabha. Now, it has been declared illegal," he said in an apparent reference to the promulgation of an ordinance making triple talaq a criminal offence. Addressing a public meeting in Talcher, Odisha, after laying the foundation stone for the country's first coal gasification-based fertiliser plant, he said the union government was committed to taking the nation forward to newer heights of development with renewed energy and greater momentum. "Talcher fertiliser plant is a proof of failure of the previous government but it will be a testament to our achievement," said the Prime Minister in Angul district. He said the coal gasification-based fertiliser plant at Talcher will script a new chapter of new Odisha and new India and it will be one of most successful ventures of the National Democratic Alliance (NDA) government. "When the Bharatiya Janata Party government came to power in the Centre, the work on fertiliser plants picked up speed. "I assure you that the construction of Talcher fertiliser plant will be completed in 36 months and I will again come here to inaugurate it," he said. The Prime Minister said that he was left stunned when such fertiliser plants have been promised for years, but no actual work has taken place. "I had asked the workers by when can they finish the pending work here and they have promised me that it will be done within 36 months. I will come back to you after 36 months," he said. The Prime Minister also used the opportunity to take on Chief Minister Naveen Patnaik for opting out of the Centre's Ayushman Bharat scheme and failing to keep the cleanliness drive momentum. "About 10 crore families, which is about 50 crore people, will benefit from the Pradhan Mantri Jan Arogya Yojana under Ayushman Bharat scheme which will be launched tomorrow (September 23) from Jharkhand. "If Odisha government does not cooperate, I will not be able to serve you," Modi said. He said Odisha needs to work towards sanitation and come at par with other states on the issue of cleanliness. "I had urged Chief Minister Naveen Babu that Odisha will be left behind in cleanliness. But today, when I have come here, I again urge Naveen Babu to give priority to cleanliness in Odisha for the health of the people here," he added. He also said Odisha will get five new medical colleges and the union government is giving Rs 570 crore for the colleges. Mentioning former Prime Minister Rajiv Gandhi's famous assertion that only 15 paise out of one rupee sanctioned by the Centre reaches the beneficiaries, he said, "They knew about the 'bimari' but had no vision to solve it." "You might remember, we had a Prime Minister in the country who had said that if Re 1 is sent from Delhi, then just 15 paise reaches the states. Such corruption continued for years. However, our government is making sure that whatever money is allotted, all of it reaches the people," Modi said. "One crore thirty lakh poor people have bank accounts in Odisha due to the Jan Dhan Yojana and the government benefits are being transferred directly to the accounts," said the Prime Minister. On the Naveen Patnaik government claiming to provide Re 1/kg rice to the poor, Modi said it is only possible as the Centre gives subsidies for this rice. "We give Rs 450 crore to the Naveen Patnaik government for these subsidies," he informed.